4. 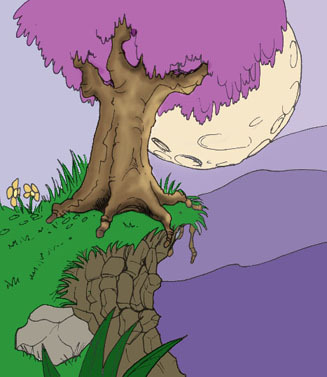 Adding detail / gradients. 7. Other techniques that will make your background look better. There are many tutorials on the net about coloring, and most of them tell you what kind of technique they have used to achieve the end-result, however in most cases they don't really focus on how the tiny details (that are so important for beginners) are done. I have made a tutorial in which I explain what steps I take to create a background in more detail. I get a lot of emails with people asking about the graphics of "Project Joe" so I think it's time to share a little knowledge on the subject. In this tutorial I assume you own Photoshop 5.0 or later. Scan your drawing and open it in Photoshop. You can use the one I used in this tutorial. Many artists scan their images in pure black or white (line drawing). I don't do this because I find the result a little too sharp. When working with animations I recommend using black and white. 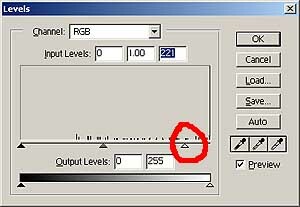 After you scanned your picture into Photoshop (file-import-"your scanner") try adjusting levels, which can be found under "images - adjust - levels". Drag the right slider a little bit to the right to get rid of dirty spots and gum strokes. Now you end up with a clear image that doesn't has sharp black & white lines but has smooth, clean looking picture. Resize the image to the format you prefer as in the end result. Resizing after you color your image makes it too much blurry and it tends to lose those nifty tiny details. Layers in Photoshop are very easy to use, the layer that lies on top, covers and affects all the layers below it. Before you start working on a layer, click it first (often people make the mistake drawing on a layer and without realising they've selected a wrong one). Even hidden layers are still active layers! Note that you can turn them on and off by clicking the eye left to your image icon. You can use this to test if you really have the right layer. Useful for those who don't give them a proper name. All layers exept the backgound layer (the one at the bottom) can be turned on or off. Make a new layer and right-click on it, select "layer properties" and name it grass. This new layer automatically goes on top of the background layer. Every layer can have a property, right now the property is normal. Set it to multiply. Now we are going to add some color to the environment. Select the "paint bucket (G) tool" from the tool menu, and check "Anti-aliased", "contiguous" and "All layers" in the options above. Pick a nice green color from the toolbar and you can start filling the grass. If the whole background is filled: undo and seek the spot were the paint comes through and cover it with the fill color using the pencil. If the pencil is too big, change the brush (topleft while pencil is selected). If any unwanted spots gets filled you can always use the Eraser tool to clear it up, because we are working on layer "grass" the background remains unharmed. Start a new layer named "rocks". Change the property to multiply and change the "fill color" to a dark brown color. Make sure the "rocks" layer is selected and fill the rocks the same way as you did with the grass. Now you've come this far I see no problem why you couldn't fill the remaining elements ;). So finish them too. Add a new layer and make sure it's on top of all the other layers. Change the property to "overlay" instead of multiply. Type "D" to get the default color combination (black and white). Pick the paintbrush tool (which is hidden in the pencil rollout) from the toolbar and change the brush size to uhh…counting….8. (3 brushes below 21), set the opacity to 15. (uncheck wet edges… cool effect though). 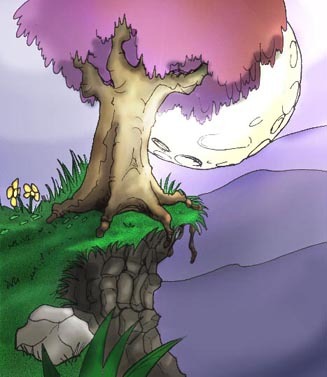 Zoom in on the tree a little bit (ctrl-+) and start accentuating dark parts of the tree. Keep a natural shadow and light direction in mind. Experiment with changing brushes or layer opacities until you get the result you are satisfied with. Add a new layer with the overlay property and press x to swap colors in the toolbar. (White on top, Black below it). Set the paintbrush opacity to a value near 15 and start drawing brighter parts of your tree. Now do the same with the other elements in the picture. At this moment your picture should look a lot better than one in step 3. It would be cool if the trees' shadow would effect the grass. Make a new layer (multiply) and pick a dark purple color from your toolbar. 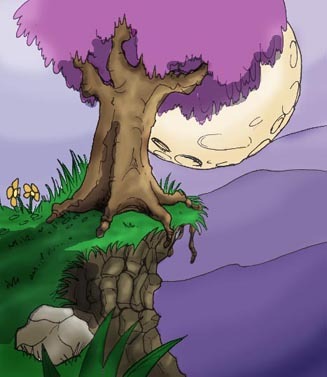 Draw a big purple spot below the tree and grass and all other things you would like shadow to fall (leaves for example. (see pic) now blur the shadow a little by using filter-blur-"Gaussian Blur" in the top menu. If the shadow is to dark change the layer opacity. Play around with "images-adjust-hue/saturation" on your colour layers to see if you can create a colour that you like better that the current one. Make a new layer on top of all the other ones. Set its property to "overlay" or "color dodge". press "d" (for default color) and fill the screen with black. (Make sure you uncheck "Contiguous" and "All layers"). Now go to "filter-render-lens flare", set the brightness to 133 and place it where you want the highlight to be (I applied it to the moon). If some spots look too dark simply erase them or change the layers' opacity. Draw the contour of objects more thick when more closer to the foreground. Draw your picture on a large piece of paper. A3 for example. When you scan and scale your image, the lines will appear sharper and less thick later on. Another advantage is that when you work with a large piece of paper you can add all the detail you want - without getting stuck between other lines. Placing a few objects closer to the foreground increases field of depth and contrast with background objects..
Lower the objects' opacity of background object lines, as if a mist causes objects difficult to see. Brighten colors that are far away, and use darker or more tinted colors in the front. Nowadays I use a 3d modelling tool in the first step to create the scene. What I do is create a room with relative simple low-poly 3d primitives. I add some lights and use shadow casting. Then I start fiddling with the camera. With this method I can preview which camera angle is the most interesting, and how objects cast shadows. You can do pretty weird camera angles without adjusting the actor (e.g making new sprites from different angles). In the Scumbag Joe demo, check out the toilet scene where a less common perspective is choosen. Compare this to "caravan outside" which was not created using this method. The second step is to print the 3d scene on paper. Place it on a lighttable, and put a blank paper on top, and start drawing! We use A3 paper to print/scan with.